1. 4 DVDs: Self-taught! Beginner-Adult in one program. Finish in 3 weeks... one section a day!!! 2. 2 CDs: Free self-taught Spelling... to adult level. Spelling Correction sheets. Pictured flashcards are for faster learning and memorizing. The 325 flashcards only cost $40 when purchased with DVDs. Pictures also on the DVDs. Flashcards have 4 extra catagories. Possessions,Plurals,Homonyms & Prefixes. 3. Quick & Easy with color-coded sentences for understanding. Complete sentence? Should you use a comma? Writing a letter? 4. Numbered, labeled, and color coded. READ WORDS THE FIRST TIME YOU SEE THEM! TEACH YOURSELF ALL THE PHONICS THERE IS TO LEARN! YOU NEED TO LEARN ALL COMBINATIONS OF LETTERS, SO THAT YOU CAN READ WORDS THE FIRST TIME YOU SEE THEM. WHY YOU learn OUR PROGRAM SO QUICKLY! WE READ EVERYTHNG TO YOU! SEE the spelling of the sound! HEAR the pronunciation of the sound! PICTURES were created for each sound! FLASHCARDS are available for those that may learn better with a "hand held tool". SELF-TESTS are used for reinforcement. We use many techniques to help you learn as quickly as possible. Fom the vowels to difficult endings, our reading program is complete. We will teach you how to form syllables, teach you the diphthongs and digraphs... and teach you everything you need to know!!! There are self-tests with answers at the end of each of the 21 sections. Now, you know what you need to learn! You're finished! PICTURES ARE AN AMAZING LEARNING TOOL! Pictures speed up the learning process! We learn 4 to 5 times faster when learning with pictures. Viewing a picture, that was created for that sound, helps us "see the sound". The picture gives you "something" to which you can " connect" to your sound! We give you everything you need to know about phonics except the homework! 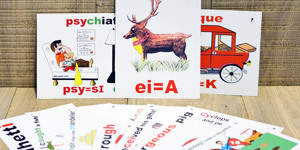 Adults with dyslexia can learn to read with the aid of pictures. Our self-taught reading program will help anyone at any age with their reading and spelling problems! It’s like watching a movie! We give you helpful reading hints! Just put the DVDS in your DVD player or in your computer. It‘s all self-taught! The flashcards have the same pictures that are on the DVD Reading Program. The flashcards are not required for the DVD Phonetic Reading Program, but they are a great “hands on learning tool” for those that feel they need a little "something extra" for learning. The pictured flashcards have four additional sections for spelling and comprehension. Free Spelling Program on CDs. Give yourself a spelling test! 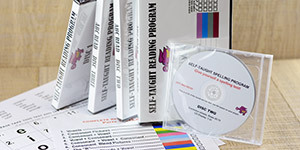 Our reading program also includes a free self-taught spelling program that goes to an adult level. Two CDs will pronounce 1680+words for you to give yourself a spelling test. 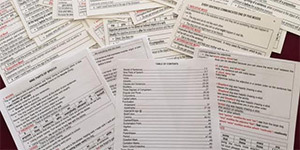 Included, are correction sheets so you can circle and learn the words you do not know. On the CDs are 1-6 syllable words... 90% of the words we use daily in our spoken and written language. Younger students will not be able to complete the spelling test. At this time I want to tell you thanks for putting together your program, and allowing me to finally grasp the ability to not only read, but find great pleasure in it. It's been an emotional transition. I ordered your course a couple of months ago, and if you would have told me that I would be able to read today as well as I do, I would not have believed it. I am 39 years old. I have spent my life not being able to read. Out of fear and desperation, I searched to find help, and stumbled across your program. At this time I would like you to know that I have just read my first book from cover to cover, "Life Strategies" by Dr. Phillip C. McGraw. After four weeks of studying your material, I was able to read and understand what I read. I have never been able to enjoy reading a book until now, and prior to this time spent needless energy covering up my inability to read. I'm even starting to pursue furthering my education. Thank you for your program, and the ability to read.